We’ve been surrounded by squalls since late in the afternoon. They have added a touch of pressure and with the wind now squared up behind us we are surfing continuously. Revs have been cut to 1750/1800 with the GPS 20 minute speed average showing 11.5/11.8 knots. This is what we expected for the entire crossing. 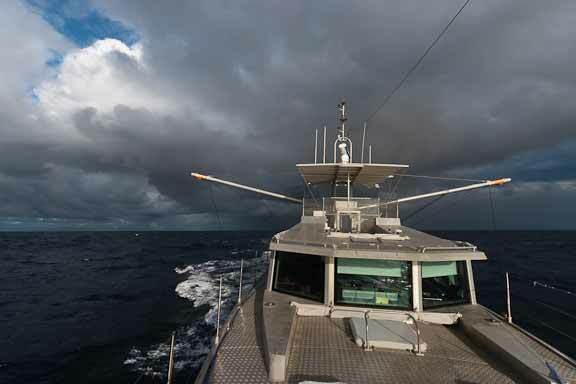 The best GPS speed we have seen (three second average) is 16.2 knots (the photo above shows 15.2). A long way from the record of 22.8, but there are still a few hours to go. 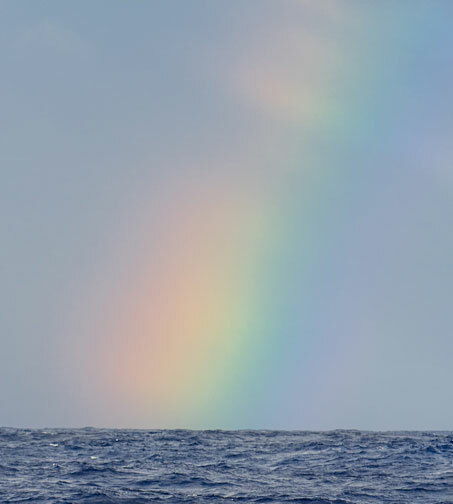 This voyage will always be remembered for its rainbows. Everyday we have been treated to something new. Today, just before dusk, Wind Horse was centered in a rainbow, surrounded with color, an apt metaphor at the close of this passage. As of 0130Z we show 218 nautical miles to Rodney Bay, Saint Lucia. The Saint Lucian and ARC flags are ready to set, as are we. This entry was posted on Wednesday, December 1st, 2010 at 12:21 am and is filed under Dashew Logs. Both comments and pings are currently closed. Visit your site every day to read the latest. “Everyday we have been treated to something new”. No mention of the Green Flash – have you not seen it on this crossing? Good show!!! This is the perfict demonstration of your FPB ideals. Good show!!! Let me be the first to congratulate you on your finish. It is only fitting that Windhorse is the first ever motor yacht to finish the rally let alone in first place.